We’re three songs into Tapestry, and Carole King has just silently mouthed, “Oh. My. God” for the fourth time. Clearly even for a veteran with 50 years of experience, not to mention one of the most respected songwriters of all time, the infinite expanse of London’s Hyde Park is equal parts daunting and exhilarating. She’s here to perform the 1971 album in full – an endeavour, remarkably, she’s never undertaken before. Nor, even more remarkably, has she ever been asked to. It’s an astonishing album, with a track listing so consistently familiar it reads like a greatest hits – ‘I Feel The Earth Move’, ‘You’ve Got A Friend, ‘Will You Love Me Tomorrow?’, ‘(You Make Me Feel Like) A Natural Woman’… Even if the opening montage – which beams the likes of Tom Hanks, Elton John, David Crosby and James Taylor (who’s playing across town tonight) singing the praises of King with relentless hyperbole – is a little sentimental for English tastes, Tapestry warrants the fanfare. Arriving onstage, she wastes no time launching into album opener, ‘I Feel The Earth Move’ – its syncopated power the perfect icebreaker for those who feared that at 74 she may, to borrow the phrasing of a current meme, not have the range. In truth, the years have rendered her voice rather raspy. But appealingly so. Even in her heyday, she never had the purest of tones – it was the sheer heft of emotion that poured out of every note that earned Tapestry its place on the vinyl shelves of much of the world, and that is still very much present. It was that raw earnestness that gave songs like ‘Will You Still Love Me Tomorrow’ a heart aching quality of which The Shirelles could only grasp the very edges. “The next song I don’t perform very much,” King explains ahead of ‘Where You Lead’, twisting herself on her piano stool to face the crowd. “It came out just before women’s lib, and it’s got kind of a ‘stand by your man’ lyric.” Instead, she sings the version she recorded as the theme tune for Gilmore Girls, references to romantic devotion replaced with mother / daughter vibes, with the help of her daughter Louise Goffin. There’s another duet of sorts for ‘(You Make Me Feel Like) A Natural Woman’ – one with King’s younger self, sat at a piano just like this one 45 years ago. She watches her past incarnation with the same wonderment as the rest of the crowd, before taking her own turn with a newfound conviction. It’s a moving and slightly eerie sight, as the crowd cheers, to see a Carole King long since gone thanking the audience for their applause. The present day King is too overcome with tears to do so herself. 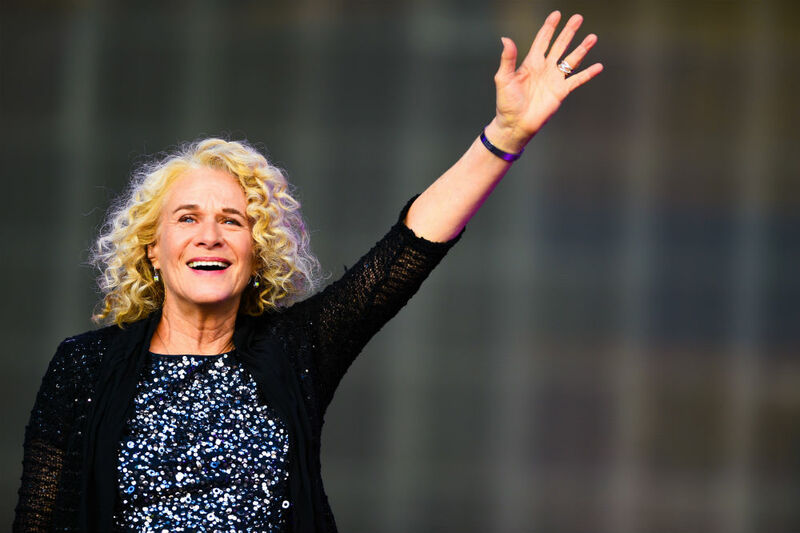 At one point, after a particularly energetic guitar-led track, King plonks herself back at the piano and announces, “So this is what 74 looks like.” 74, then, looks like one of the most talented musicians singer-songwriters of all time having the time of her life.